A stone's throw from a Confucius Temple is a little shop where a visitor could easily mistake it for a hutong family's living room. 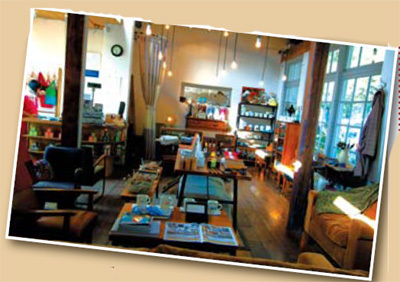 Lost & Found is decorated with 1970s-style furniture and household odds and ends, such as thermoses and sewing machines. "Sometimes buyers are confused and wonder what is for sale," says the manager, nicknamed Little Cat. "Because everything seems a necessary part of the room." In fact, all the articles are for sale, except for an old barber chair at the door, a favorite of the owner. There is a cozy feeling about this little store with its wooden floors, wood-beam ceiling and light-seducing white windows. Although the shop is styled after 1970s Beijing, with dark brown colors and old-fashioned tables chairs, it is actually designed by American expat Paul Gelinas, who is a partner in the shop. "When he came here to work for Beijing Olympics, Gelinas designed the shop, and he was then a Yale student in stage design." Gelinas also designed the furniture on sale. "The original pieces are mostly collected from flea markets and some are picked up from the street," says Little Cat. "Paul kept the basic structure and made slight changes in details and great improvement in material, size and comfort." Each piece of furniture is a limited edition "so the price is relatively high". For example, the cheapest chair costs 300 yuan and the most expensive cabinet has a 10,000 yuan price tag. "But they are durable and practical," Little Cat says. "If it can be used for a life time, the price is reasonable." Lost and Found also sells clothes and accessories, which are designed by Little Cat. The style is casual and made of cotton or linen. Prices start from 200 yuan to 600 yuan. A special series of cotton T-shirts, priced at 138 yuan, with characters that say "Care for Tree Saplings" for example, are a popular item. "These T-shirts are designed with words only found in the 1970s books of print paintings and magazines. These words' style is powerful and serious." The shop also sells popular art magazines from Taiwan, such as Booday and Ppaper.